Nina Ottosson Dog Brick Treat Puzzle Toy. Nina Ottosson Dog Brick Treat Puzzle Toy helps fight boredom, engage and entertain. Simply flip, slide and treat! The Nina Ottosson Dog Brick is a great way to engage and entertain your dog. This treat training dog puzzle occupies anxious dogs and entertains them, helping to prevent boredom and destructive behaviors. The Nina Ottosson Dog Brick is one of the newest and most versatile dog games. This Dog Brick game presents your pup with a new challenge every time they play! Complete with 3 different treat feeding features, the Nina Ottosson Dog Brick is made with easy to open-close flip compartments to hide treats in, and is equipped with separate, removable bone puzzle pieces that offer an even more interesting challenge to seeking and eating treats! – 31,5 x 21 cm, height 4 cm. / 12,4 x 8,47 in, height 1,58 in. 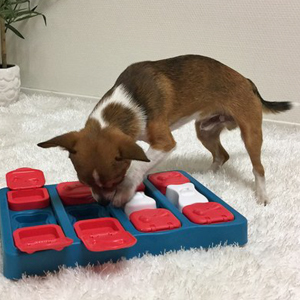 – Different from the level 1 Nina Ottosson Dog games, level 2 dog games like this Dog Brick offer increased stimulation and learning options. Your dog will benefit from the mental challenges dog games present, and grow through interaction and fun with you! 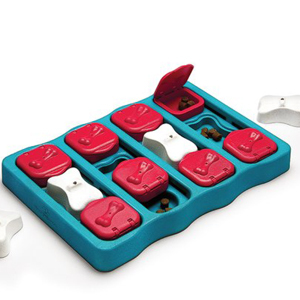 – Place treats or kibble in compartments of base and sliding blocks. Cover middle compartments with the bones. The more covered compartments, the harder the puzzle will be! Let the games begin! Show your dog how the game works and encourage them to find the treats. Dogs are smarter than you think. Sometimes we just need to teach them! 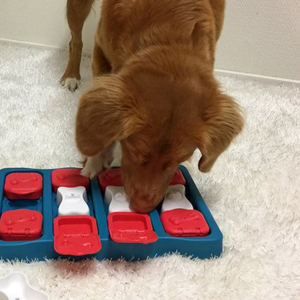 Leave some of the bones out and flip open the blocks to gain your dog´s interest. – Mix some canned/wet dog food or raw food with water, pour some of the mixture in the hollows, or place a small piece of sausage or a tasty treat in each of the hollows, pour a little water, put the game in the freezer and let it set. Perfect for energetic dogs, hot weather, or just extended fun. – Nina Ottosson Dog Puzzle Games focus on challenging your dog’s brain. Supervise when playing, and don´t let the dog chew on the toy. Teach your dog how to use the puzzle, play and have fun together. Put away until next time. – Dog games and dog puzzles by Nina Ottosson challenge your dog’s problem solving skills while enhancing your dog’s mental stimulation through fun and play. – To wash your dog’s DogBrick, simply remove all treats/kibble and hand wash with warm soapy water, rinse clean and dry. Fill again for more fun! Treat your best friend today!